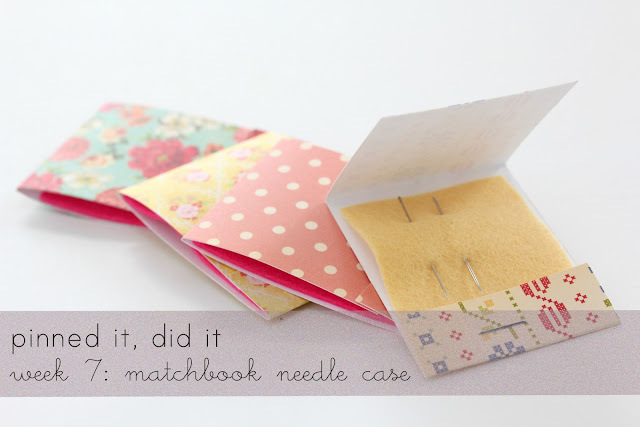 I made a few of these cute needle cases after seeing them on Pinterest. These were easy and quick to make and the tutorial at Make it Do was simple and clear. I thought they would be perfect for keeping a couple of embroidery needles stashed here and there. I am a traveling stitcher, so it will be handy to have one of these tucked in my bedside table or in the junk drawer. Just in case you were wondering (and I know you are), my current favorite room of choice to stitch in is our kitchen dining area. It is my favorite peaceful moment of the day when I get home from work, turn on Mad Men on the iPad, and stitch away at our sunny kitchen table while Sawyer naps. Can you think of any other uses for these? I thought it might be handy to keep a few safety pins on in my wallet. Maybe make a little sewing kit for travel? These are fabulous! I haven't seen them before. I love these! I'm so glad you showed us! Wedding day bride's emergency kit absolutely. Stash a safety pin, a couple of bobby pins, a tissue. This is so cute! I like DIYs that are actually useful : ) Thanks for sharing! So cute!! Your paper choice is so great! These are so cute and such a good idea. My needles are all just loose in my sewing storage containers and I can never find them. Ooh, I like the idea that Christina said above - bobby pin holders! By the way, I'm curious how you put your text overlay onto your photos like on this one. Do you use Photoshop? Very creative and very simple! I hope to make myself one! Many thanks for sharing!